Do you want a lawn mower that’s noiseless and eco-friendly? If so, you should read this article for a detailed review of the 5 best manual push mowers 2019 on the market. In recent years, people have started purchasing electric-powered or battery-powered versions of all their home maintenance utility tools. Seeing the benefits of electric and battery-driven lawn mowers is easy — they’re efficient, easy to use, and powerful. However, a manual push mower has several advantages over their gas or electric alternatives. A manual push mower doesn’t produce the annoying noise of engine roaring that the electric and gas mowers do. As such, it’s ideal for yards located in thriving neighborhoods wherein a noisy lawn mower would disturb the neighbors. Furthermore, a manual push mower is also a lot more eco-friendly as it doesn’t consume any energy nor produce any noxious fumes. There are a lot of great manual push mowers to choose from. As such, we conducted a thorough research of the most popular manual push mowers on the market in order to produce this detailed review articles. In this article, we’ll give you a thoroughly detailed review of the 5 best manual push mowers on the market. American Lawn Mower 1204-14 is undoubtedly the best manual push mower on the market. It has been designed with an alloy steel frame that provides the necessary durability to ensure that it works perfectly for several years at a stretch. Furthermore, the polymer wheels don’t get punctured and can mow through the lawn effortlessly. It snips the blades of grass in a manner that their health is maintained so that the quality of your lawn doesn’t deteriorate over time. It has 14-inch blades that are ideal for mowing one’s moderately-sized backyard. However, if you use it for really large lawns, it will take you a lot of time. The biggest challenge ahead of this push mower is getting through debris-ridden lawns. Stones and pebbles can get stuck in the blade and result in them locking up. As such, before using this mower, you need to sweep over the lawn and get rid of obstacles. Furthermore, it has a cutting height that ranges from 0.5 to 1.75 inches. 0.5 is not short enough for the purposes of many individuals. Not ideal for large lawns. The minimum cutting length should be shorter. American Lawn Mower 1204-14 is the deal manual push mower for small and moderately sized lawns. However, it should have a shorter cutting height as well. Scotts 2000-20 Classic Push Reel is the best manual push mower for large lawns as it has a cutting width of 20 inches. 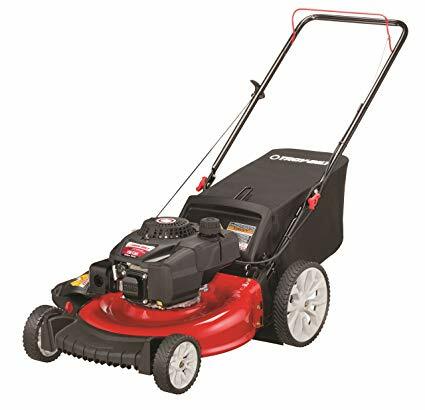 This is a great lawnmower because even though it’s a lot cheaper than gas and electric mowers, it can still cut grass with the same power. The cutting width is 20”, which one of the highest out there. As such, you can get the job done really fast with this manual push mower. Its height can be adjusted through 9 different levels, both extremely short and long. 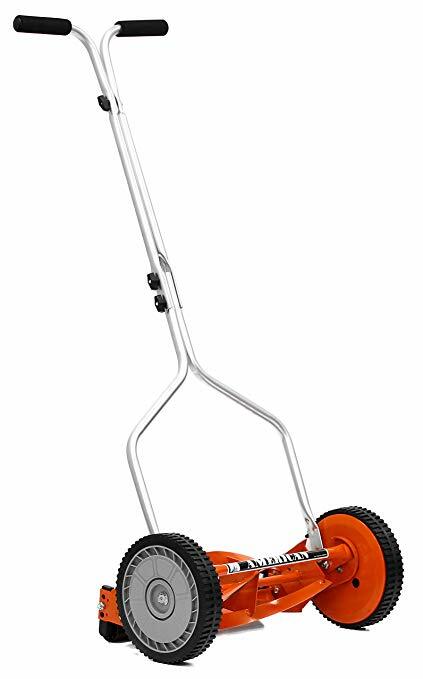 Furthermore, this manual push mower is extremely lightweight and has a dual-wheel tracking technology that ensures that you can move it easily without any hindrances. The biggest issue with this mower is that the bolts located on the handles keep coming undone. As such, you’ll have to keep a screw-driver handy and tighten them every once in a while. Furthermore, the warranty is also a let down as it only covers defective parts for a period of 3-years and the replacements have to be shipped by the user at personal expense. Easy to maneuver and assemble. Scotts 2000-20 Classic Push Reel is an extremely powerful and easy-to-use manual push mower that can mow large lawns quickly. However, it’s not designed very well and has a poor warranty. Fiskars StaySharp Max Reel is one of the best manual push mowers with a cutting edge of 18 inches. As such, it’s ideal both for small and larger lawns. The best aspect of this manual push mower is the InertiaDrive which helps mow through all types of lawns, even if there’s some debris and obstacles along the path. Furthermore, it has a minimum cutting height of 1 inches, and a maximum of 4 inches. As such, it’s perfect for those who want a finely close-cropped lawn. The pins for height adjustment often come loose. 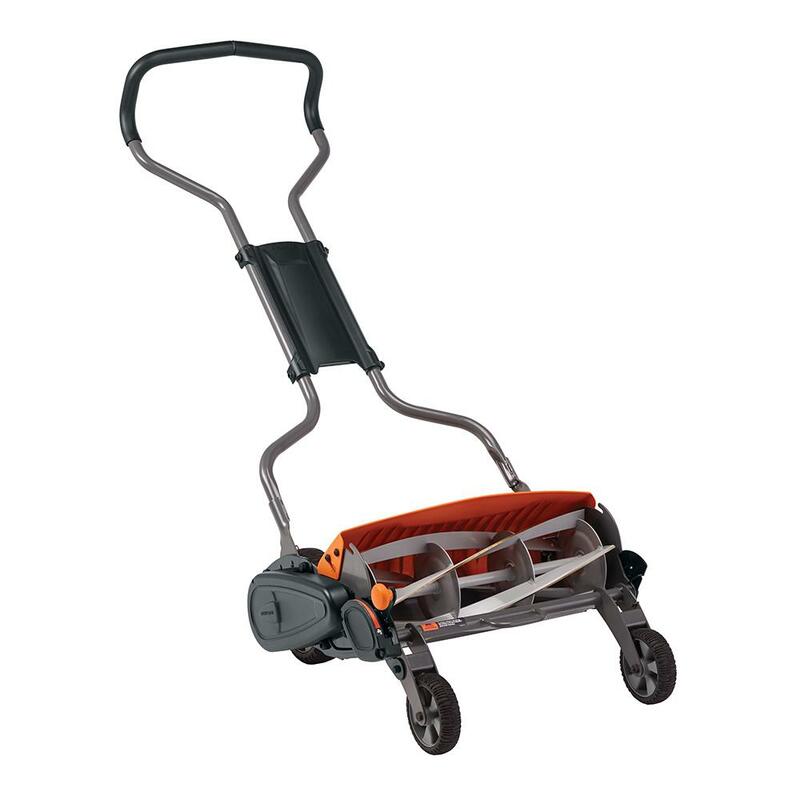 Fiskars StaySharp Max Reel is the ideal manual push mower for those who prefer finely cropped lawns. However, it’s considerably more expensive than other mowers. 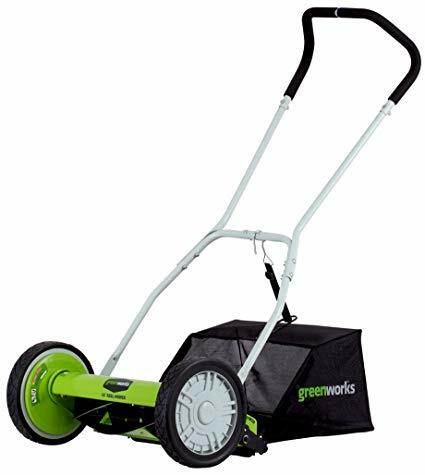 Greenworks 16″ Reel Mower is the best budget-friendly manual push mower on the market. Its best feature is the fact that it comes with a rear-mounted bag that can catch all of the grass clippings. As such, your lawn will remain neat and you won’t have to clean it after the mowing is done. 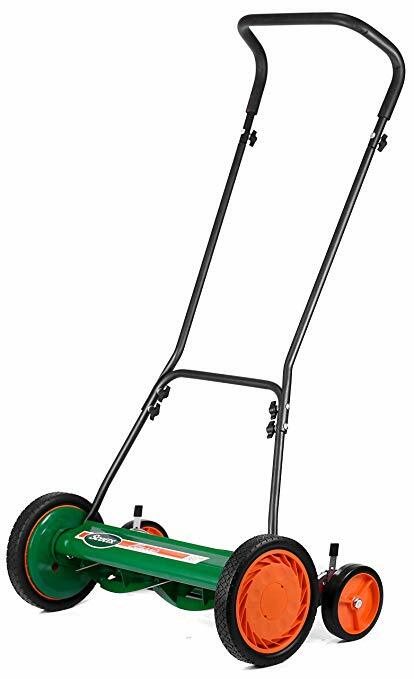 It has a 16” blade that’s ideal for small and medium size lawns. The wheels are elevated at 10 inches and the blades have a cutting height between 1 1/8-inches and 2 1/4-inches. Comes with a grass catcher. Grass catcher comes off easily. Gets stuck on weed and obstacles. Greenworks 16″ Reel Mower is extremely convenient because of the presence of a rear-mounted grass catcher. However, it’s not very efficient. Troy-Bilt TB120 is a very powerful manual push mower meant for small and medium sized lawns. It’s equipped with a 159-cc Powermore-OHV engine that’s extremely powerful and has 6 height adjustment levels. It also comes with a 1.9-bushel bag to catch all the grass clippings and leave the yard neat. Easy to maneuver because of the 4 wheels. Troy-Bilt TB120 is a powerful but heavy manual push mower that should be used for small or medium sized lawns. Even though we have given you a list of the 5 best manual push mowers on the market, your search isn’t over. There are a lot of factors that determine which is the best mower. Furthermore, a mower might be great for one person but not for another. As such, in this part of the article, we’ll go through all the factors you should take into consideration to determine which is the best manual push mower for your specific needs. A manual push mower needs to be moved around by hand. As such, you need to make sure that it’s easy to maneuver. There are two factors that determine its ease-of-use — weight, and maneuverability. Basically, the machine needs to be lightweight enough that you can move it. However, it shouldn’t be so lightweight that the engine isn’t powerful and can’t move across grass smoothly. It should also be ergonomically designed with padding so that your arms don’t get tired and there’s enough shock absorption in place. Manual push mowers usually come with an adjustable cutting height. This determines how long or small your grass will be. You should get a mower with the widest range possible — extremely low at the bottom, and extremely long at the top. Amongst the two, the former, i.e., low height, is more important. The wider your cutting width, the better. The width of the blade determines how much of the lawn it can mow down at a single go. As such, if you use a small width on a large lawn, you’ll spend a lot longer mowing. Generally speaking, smaller lawns need a width of about 16 inches whereas larger lawns need at least 20 inches. It’s also important to take into consideration the wheels, blades, and the frame of the mower. For lawns with irregularities, fences, etc, you’ll need a mower with inset wheels that can cut against the boundaries perfectly and not leave messy edges. Different manual push mowers handle the grass clippings differently. The cheapest ones simply let the grass fall down. As such, you’ll have to later scoop them up or clean the yard manually. Some mowers divert the grass clippings to the side, thus creating a streamlined parallel pattern of grass clippings. Finally, the most expensive ones funnel them into a bag so you can easily dispose of them. I hope this article has helped you figure out which is the best manual push mower for your needs. We provided you with a well-researched list of the 5 best manual push mowers 2019, along with a Buyer’s Guide to help you figure out how to make your decision. If you have any other questions about the best manual push mower on the market, feel free to mention it down in the comments section.